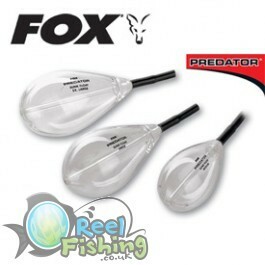 Pear shaped float designed to be used in conjunction with a sunk float paternoster rig which tethers a bait in a fixed position. This new clear blow moulded version is designed to be inconspicuous to avoid spooking wary predators. It can be fixed by the bottom rubber sleeve over the swivel of the essential uptrace, which avoids the need for a bead and stop knot.